Tonight we were supposed to get pizza and watch Frosty's Winter Wonderland but we had a slight change of plans. When I got home from work Nate said he didn't feel good so it was just me and the girls tonight. I asked what they wanted to do and they shouted "PIZZA!". Come on...can't we do something other than pizza?? I got them to change and we went to Dairy Queen instead. YEAH! While I was there I ran into a friend of mine from high school and her kids. Amy, you always have such great hair! While we were leaving I past a kid I used to have a crush on in high school too. 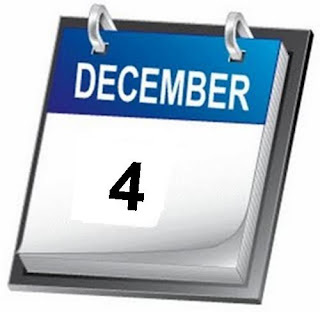 How funny that time goes so fast. Makes me laugh at the ideas I had in my head! Next up was our next plan for the evening. We were supposed to watch Frosty but isn't a tree lighting so much more fun??!! 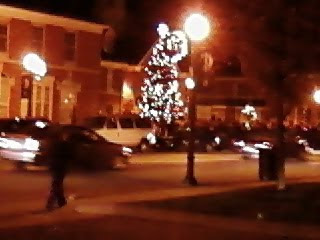 They were lighting the tree in uptown Westerville so we decided to hang out in Westerville and watch the fun. They had caroling, the band played Christmas songs, and Santa even came! The girls loved it. I'm sure everyone really enjoyed hearing Aiva sing Jingle Bells at the top of her lungs too! I just looked at her and looked around at the others wondering who's kids she was! Once it was done, we bolted and headed home to see if we could catch the end of Frosty but it was too late. We settled for Wonder Pets :) That's good enough. Ana loves Nick Jr! OK...time to get the kiddo's in bed. Hope you have a great weekend! Bummer that Nate didn't feel good, but it sounds like you had a great night with the girls! How fun!